Here’s the caption straight from the video itself, reiterating the claim. Jerry Yeoman’s horrible barrel roll crash from Wichita International Raceway while racing Jim Wiens in the Pro Mod final of the Wichita Summer Nationals. 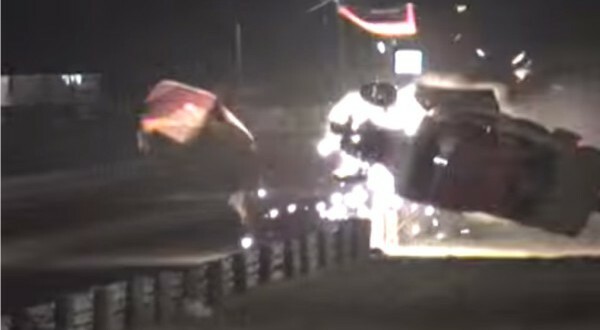 Jerry’s naturally aspirated Pontiac took a hard left turn at the 1/8 mile stripe sending it over the guard rail where it exploded and rolled 12-14 times before coming to a stop at the 1/4 mile. Jerry suffered some pretty serious injury’s but made a full recovery. He is now driving an absolutely beautiful ’59 Turbo Corvette Pro Mod.